The ancient city of Mosul on the west bank of the Tigris in what is today Iraq, once home to the palace of King Sennacherib and Library of Ashurbanipal, has had many different rulers seek to profit from its location as a hub in trade routes connecting Persia, India and the Mediterranean. In 1262, it was conquered by the Mongol forces of Hulagu Khan, grandson of Genghis Khan who expanded the southwestern Mongol empire from Uzbekistan to Syria. Hulagu was not known for his light hand. Any cities where he encountered resistance were destroyed and their inhabitants slaughtered. 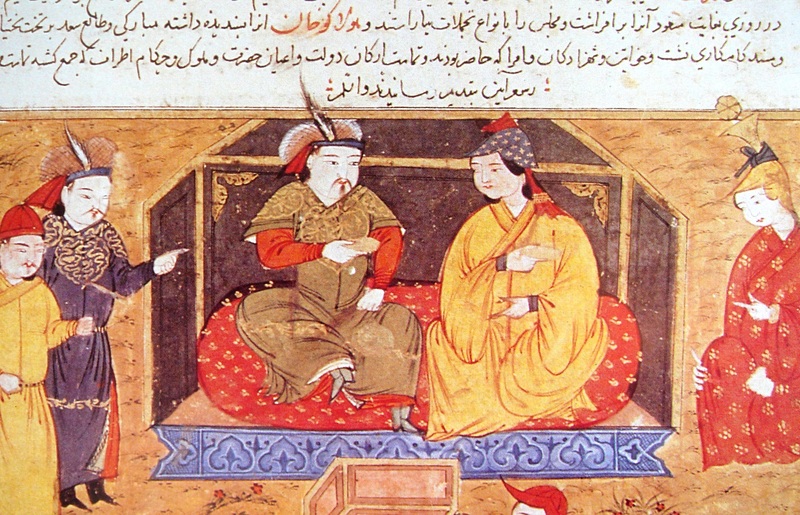 When the Mongols conquered Baghdad in 1258, they virtually leveled the city. It’s said that the waters of the Tigris turned black with the ink from the thousands of books from the Grand Library of Baghdad that the Mongols threw into the river. Mosul was spared, however, because governor Badr al-Din Lu’lu’ agreed to support Hulagu’s invasion of Syria. The Mongol Ilkhanid and Jalayrid dynasties ruled Mosul through the 15th century until it was conquered by the Turkic Aq Qoyunlu Confederation. Even before the arrival of the Mongols, Mosul was famed for its exceptional metalworking tradition. 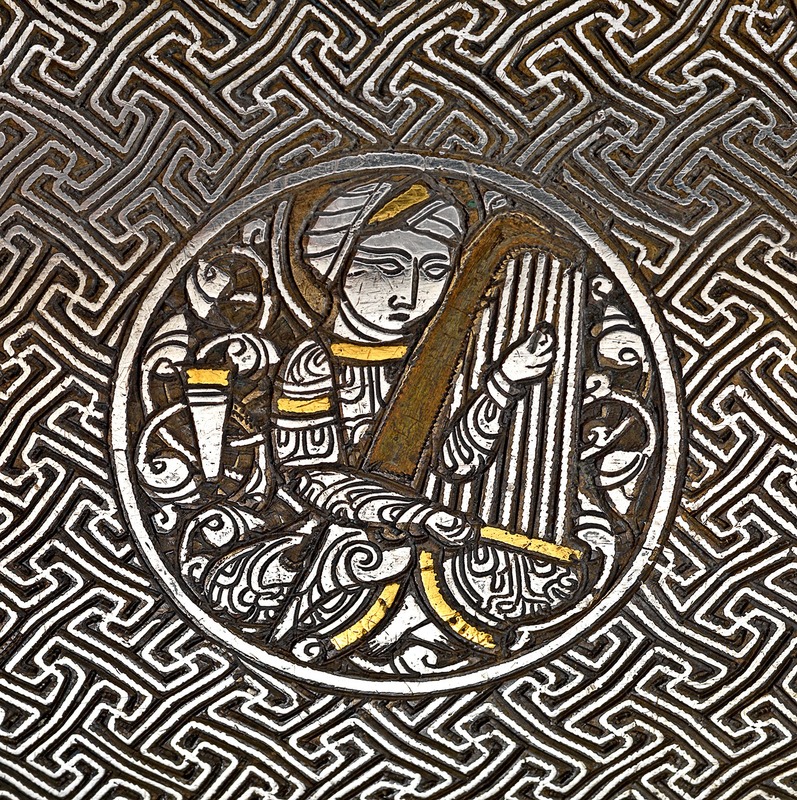 The technique originated in Persia, but Mosul’s location at the cross-roads of trade influenced the craft, introducing new forms of vessels and designs from the Byzantine Empire. Brass containers were inlaid with silver and copper creating intricate geometric decoration and scenes of courtiers hunting, traveling, adorning themselves, drinking, eating and listening to live music. The Blacas Ewer, now in the British Museum, is an exceptional example of Mosul metalwork. 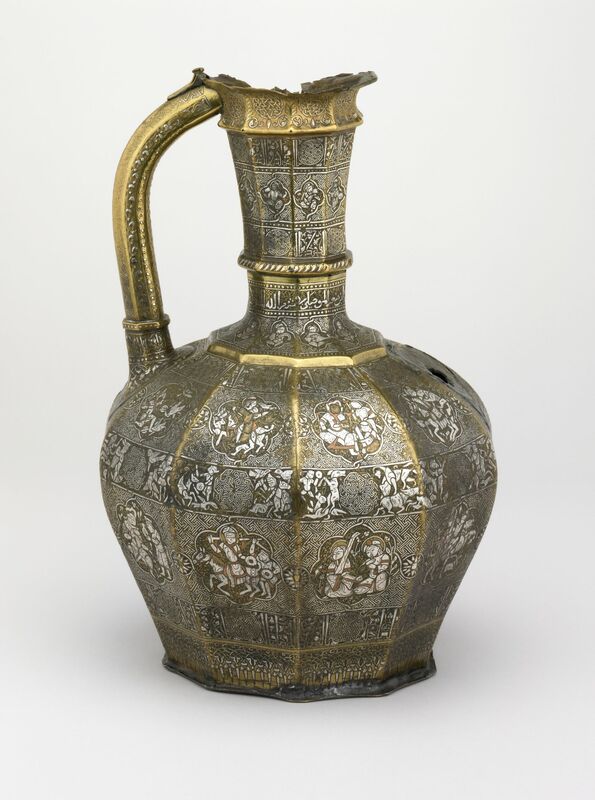 Made by Shuja’ ibn Mana al-Mawsili in 1232 (he signed and dated the piece, for which we were eternally grateful), the ewer may have been commissioned by Badr al-Din Lu’lu’ or one of his courtiers. He is known to have commissioned a number of pieces that bear his name. 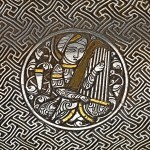 As noted by Spanish Muslim author Ibn Said al-Maghribi in his 1250 book Geography, Mosul metalwork vessels were so highly prized they were used as diplomatic gifts, a high honor considering they were made out of brass instead of the gold and silver that were the expected standard of gift-giving between rulers. 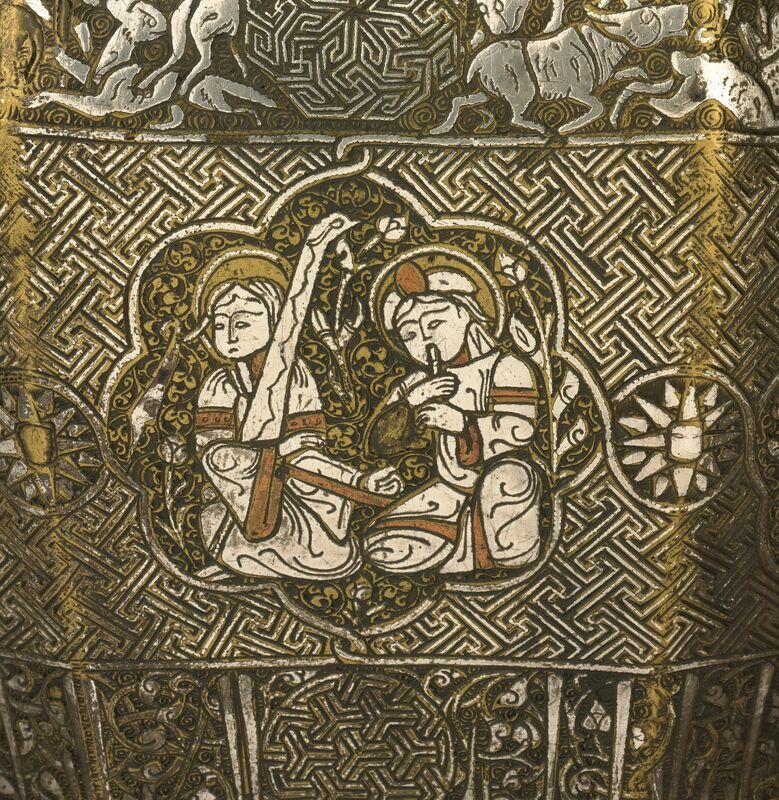 The Courtauld Gallery in London is the proud owner of another example of Mosul metalwork, a piece made in the first century of Mongol reign around 1300-1330. This form is one of a kind, so exceptional that it is rarely included in studies of the craft. The artifact has been part of the Courtauld’s permanent collection since 1966 when it was bequeathed to the institution by the grandson of collector and museum patron Thomas Gambier Parry. Experts have debated its function for decades. 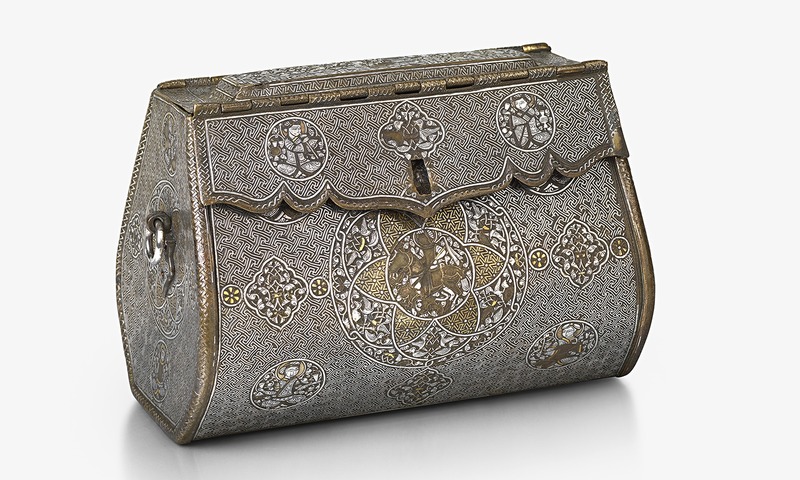 It’s shaped like a clutch purse, but they weren’t making brass ladies’ handbags in 1300s Mosul. Some proposed functions include wallet, saddlebag and document carrier. The Courtauld is putting on a new exhibition centered around this beautiful piece. Court and Craft: A Masterpiece from Northern Iraq proposed a new function for the Courtauld wallet: a lady’s shoulder bag. Exhibition curator Rachel Ward found an important clue in the decoration of the bag itself. The key to unlocking its secret is an unusual panel on the top showing a nobleman and women and their attendants. One of those, a smiling page boy, has the bag around his shoulder. Wider research by Ward has turned up considerable visual evidence of bag-carrying page boys next to noblewomen but never alongside men. “Other people in the past have called it everything from a work basket to a document wallet and inevitably male academics always assume it was for a man. 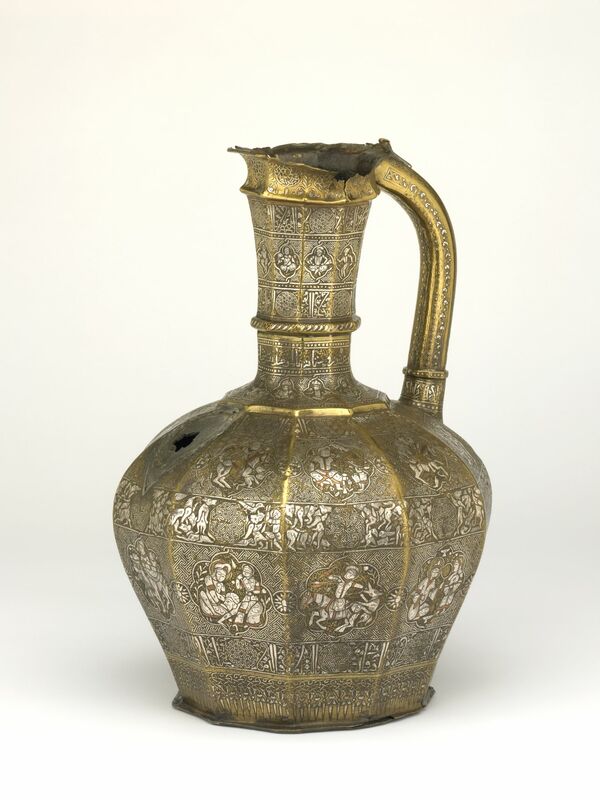 The bag will be on display along with 40 other relevant works from collections around the world, including the Blacas Ewer. The exhibition will look at how Mosul society was depicted before and after the Mongol conquest in its art. The museum will also recreate the scene from the top of the bag, building a life-sized display of the courtly festivities from artifacts similar to the ones depicted. The exhibition opened on Thursday and will run through May 18th.